Hollywood, CA: Sunset Sound has completed refurbishment of its vintage, 96-channel Neve Model 8088 board equipped with Flying Faders moving-fader automation, and Studio #2 is open for business. Neve expert Fred Hill, president of FC Hill & Associates, based in Nashville, spent a week at the facility late last year to supervise the re-installation of the refurbished channel modules into the 8088's rewired and enhanced mainframe. "While the modules received a thorough cleaning, overhaul and modifications process down in Nashville," says Sunset Sound president Paul Camarata, "we spent time remodeling the control room and performance area, and building a second, larger isolation booth. The combination of this classic Neve and our classic sounding room will be killer!" "A vintage, 96-channel Neve 8088 board is a dream come true - a 48-input/48-monitor Discrete Class-A console with state-of-the-art Flying Faders automation. We spent a long time looking for a great-sounding, all-discrete Neve board that could meet our clients' requirements for both mixing and tracking. Fred Hill's modifications will also offer outstanding flexibility to our clients; the sound of this refurbished board is going to be truly remarkable." "Fred went though through every electronic function," explains Sunset Sound studio manager, Craig Hubler. "Each module was fully checked out - all capacitors replaced, each component examined and replaced if necessary. Our 8088 is one of only three larger-format 8068 consoles built by Neve with 48 input channels and 48 monitors, providing 96 channels for remix. Of those three, extremely rare consoles, ours in the last one to leave the factory, and the last design to be supervised by company founder Rupert Neve. These are special boards!" "Basically, we poured vintage wine into a new bottle," Paul Camarata concludes, "and made certain that our control room and tracking area retained their legendary acoustics. We are confident that everyone will be pleased with the results." 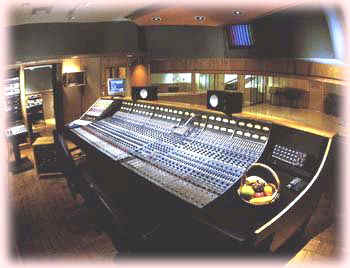 "Sunset Sound - where the best of the past meets the challenge of the future"